Kenneth teaches the system of drafting trousers (for men and women) from measurements. 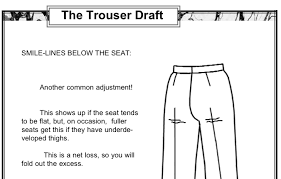 After taking the proper measurements (which is covered in the text, as well as on the video on the Flash Drive or Digital Version of his book), we cover calculations for the draft, and drafting the trouser. Once the trouser is drafted and made, common adjustments that might need to be made to the test the fit in the muslin to ensure proper fit. Finally, after a well-fitting trouser muslin has been made, the directions for adding style, such as pleats, pockets, waistbands, and the like, will be discussed. Class Notes will be mailed to you to print out and you must bring them. His book goes into greater depth on this method is available on a Flash Drive Book or Digital Version is available for purchase.$24.95 US shipping, click here. $24.95 for Digital Version click here International Shipping of a Flash drive $32.95 click here. No refunds after March 10. 2019. If you cancel before the registration deadline, March 10, 2019, you will receive a full refund, less a $5.00 processing fee and the PayPal fees. If you cancel after the registration deadline, a student will need to replace you, you will receive a full refund, less a $5.00 processing fee and the PayPal Fees. The workshop will be held at the Charlotte Sewing Center, 5113 South Blvd, Charlotte, NC 28217, (704) 525-9022. Two nice hotels near our store are a Best Western at 242 E. Woodlawn Road and a Four Points by Sheraton at 315 E. Woodlawn Road in Charlotte. Both are 3-star hotels and are located about 1 mile from the store. Links to both are given below. Class notes will be emailed to you. You must print them out and bring them to the workshop.